I suffered enough as an indie author trying to market myself and was determined to be traditionally published. I researched a list of agents to submit to, taking care to match my nonfiction title with their wish lists, and worked up my query letter, rewriting and revising, until it was perfect to represent my manuscript…or so I thought. I was fully prepared for the inevitable “no thank you’s” and resolved to rework my original self-published novel in order to keep my mind off the rejection and waiting. I started my query slowly, just ten agents who would judge my life’s work based on the few paragraphs of my carefully formulated letter. I took care to craft each message to be personal and noteworthy enough to garner attention and hopefully land that coveted “yes” email. With the click of ‘send’, my new career already coalescing in my mind, I hurried to my project to pass the time and wait for responses to come rolling in. After a few weeks and no responses, I took another look at my letter and realized it wasn’t as great as I once thought and sought help to revise it. Finding like-minded writers on a helpful forum, I got my first real healthy dose of reality. My letter had failed to communicate what my manuscript was actually about – at all. Sure it caught the readers’ attention, but even I wasn’t able to tell what my book was about after reading it again. Epic failure: and I thanked the forces that stopped me from mass emailing it. I quickly revamped the letter to be more informative – and well, something that actually said what the book was about, and focused on a new plan; having recently joined a local writing club. They were having a conference, and this afforded me an opportunity to get up close and personal. Armed with my new letter, I signed up for both a letter and manuscript critique, and got 2 pitches as part of the deal. I maximized my chances of getting published, because I had finished revamping my original self-published fiction piece. Pulling it off the market, not that anyone noticed, revamping and retitling it, it was ready for scrutiny. I had a non-fiction submission, and my revamped self-published YA fiction – both giving me ample opportunity to sway an agent or publisher to look my way. With two very different pieces, I felt I was bound to get some positive response. Using the manuscript critique for the fiction and letter critique for the nonfiction, and a pitch for each, I was sure to walk away with some kind of interest. I received my assignments, and I couldn’t believe the luck. I had been assigned a pitch with the lone publisher for my nonfiction, and not just any publisher, but the very publisher that I had hoped for. I believed the Universe was finally smiling on me, but little did I know that Fate still had a hand to play. I attended the workshops and events, when innocently enough, one of the workshop instructors asked me for my elevator pitch. My what? Somehow, in all my preparation I had failed to actually develop one. Luckily, a new friend at the conference saw my struggle and helped me develop a great one-line pitch. I was finally feeling confident I wouldn’t experience another ‘deer-in-the-headlight’ moment. Then came the big critique sessions; my dread looming. I met with a wonderful agent on the fiction manuscript, and she really liked the piece and asked for a partial. I was so excited; I started that I’d sell both works. Then on to the letter critique, with two wonderful agents, neither of which handle nonfiction, but were both very intrigued by my letter and helped me tweak it to perfection. They both really liked the idea so much they actually expressed that they wished they handled nonfiction. More positive reinforcement! I was floating on air; I had one actual request, from an actual agent, for my work. Someone liked my writing enough to want to read more. And two actual agents were kicking themselves that they didn’t handle my genre. Could things get any better? I set out to fix my nonfiction letter and prepare for my meetings. I pitched the fiction first, and fate reared its ugly head and burst my happy bubble. The agent basically critiqued my letter and handed it back – don’t misunderstand, she was kind and polite, but I was crushed – literally fighting tears back as I left the meeting room. I spent so much effort on the nonfiction that I had neglected the fiction altogether. Worried I would make a fool of myself and lose the only chance I’d have to sway my ideal publisher, I was losing confidence in my work. With only an hour to cry and plan, my new friends tried to reassure me; I rebounded but the sting was still fresh in my mind, and I doubted myself. But I went to my nonfiction pitch with a new resolve. I knew if I could get her to read my proposal, she would want the manuscript, so I asked the coordinator, something they don’t normally do. He agreed to take my proposal in with my letter, which was more than I had hoped for. I walked into the room, and there a warm, friendly editor sat waiting. She immediately asked for that elevator pitch, and even though I fumbled at first, I finished just like I had practiced. It worked! She was more excited about the project than I had been, and I walked out with a full request, not that you could have heard anything else from the choir of angels that was singing. Back at home, I readied my submissions for the requests and impatiently sent them out. As the days and weeks passed, I thought the longer I waited the better the news would be. I heard about the fiction submission first. The agent didn’t connect with the main character, and suggested that I read a few more books similar to mine before moving forward. Not even the glimmer of a revise and resubmit. I consoled myself saying I hadn’t worked as hard on it, and the nonfiction would get me in the door. There’d be plenty of time later to work the fiction to perfection. But then my world came crashing down a few days later when the publisher responded. She loved the idea but had a hard time seeing the potential reader. A lovely 'no' with class, kindness and support that my work would find a home; but the best rejections are the hardest, seeing how wonderful working with that person would have been and realizing it won’t happen. My heart was broken, and no amount of chocolate or crying like a two-year old was going to fix it. Finding an agent is like finding a mate, you have to go through all the wrong ones until you find the One, the right One. Agents have hundreds of people all wanting to work with them, and I don’t envy them their job. They are some of the nicest people you’ll ever come across; they try to be kind and supportive, they remind you that it IS subjective, and you WILL find someone that appreciates your work and your voice. Ever the eternal optimist (and hopeless romantic), I try to see rejections as the proverbial ‘frogs I have to kiss’ until I find the right One. 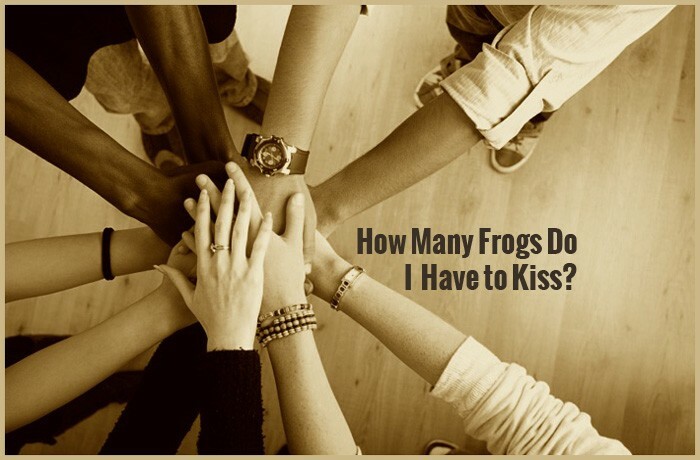 So if you haven’t found your perfect agent, keep kissing, your frog is out there, somewhere, just waiting for you. I’m still looking for mine, and kissing away until I find them.